You know that feeling, the feeling of getting back to something without realizing you'd been missing it terribly? That was me, this morning, sitting in the rocking chair and watching the birds, (at work! I love my job) stitching away. I don't think anyone's ever called darning socks an enjoyable pastime, (and honestly, I've never actually darned a sock) but I'm going to step right up and do it. 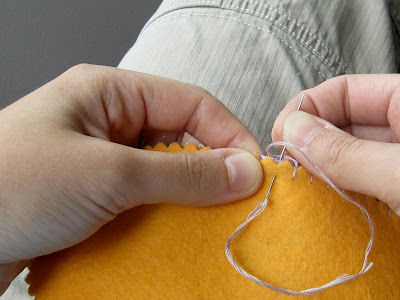 Hand sewing, with pretty thread and a sharp needle, feels amazing. I'll allow that maybe it doesn't feel amazing to everyone. But really, if you've never tried it, you should. It's one of the sweetest forms of therapy I know. Sitting there, part of my mind fully present in each little stitch, my hands working their capable magic on two pieces of fabric which are being united by simple thread... while the other part of my mind is free to drift into or out of self-consciousness as it pleases. I can let my thoughts turn to whatever I want-- get as deep inside myself and my place as I choose, or think about a recent quote/movie/song I encountered, and start to hum. At any rate, it had been a long time since I sewed anything by hand. As in, maybe not since last Christmas. Early this morning, I had a reminder to keep making space for it in my life. The cooking, the canning, the hikes and drives and trips to the grocery store have their place. But I need to remember to push back the thickets of obligation and make time for holding that needle. great post, kristina! i feel this way about my knitting. That's what I do when I drive...so far, no accidents! For some reason, "Get Into the Groove" by Madonna pops into my head with the title of your post. It could be my brain is fried today, but it made me sing a couple of lines from it. Great post. I love reading comments! What a great bunch of minds there are who read this thing I call a blog. Kami, someday I'd like to be able to enjoy driving as much as I enjoy hand sewing. That's the goal. What's the secret?